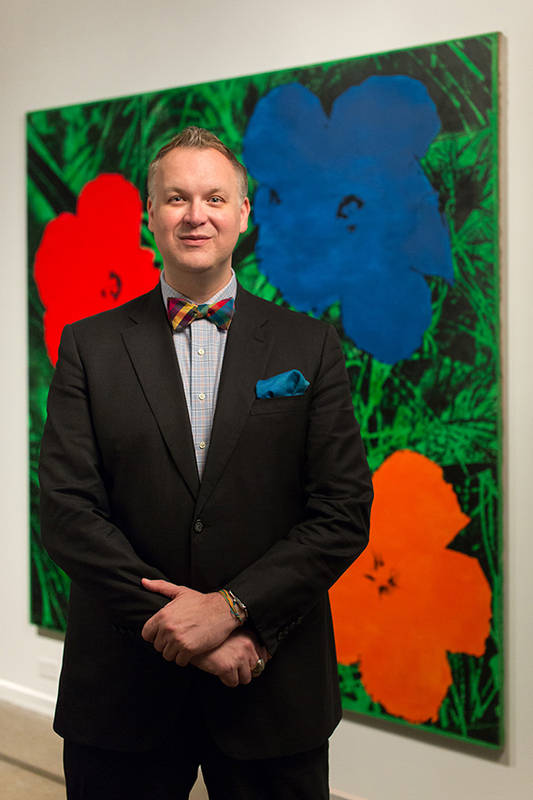 Eric Shiner, Director, The Andy Warhol Museum, Pittsburgh. Photo by Abby Warhola. The Andy Warhol Museum in Pittsburgh, Pennsylvania has the largest collection of Andy Warhol's work in the world, including nearly 900 paintings, thousands of drawings, and photographs, notes, archives, and 610 Time Capsules. In this conversation, Eric Shiner, the director of The Andy Warhol Museum talks to us about (a) the museum's mission, (b) exhibition strategy, (c) contemporary art exhibitions at the museum, and (d) its decision, inspired by Andy Warhol's life, to create a platform for expression of differing political viewpoints. Lilia Ziamou: The Andy Warhol Museum is "the global keeper of Andy Warhol's legacy." What do you see as the legacy and how do you achieve these aims? Eric Shiner: At The Andy Warhol Museum we have the great luxury of representing Andy Warhol, who was one of the most well-known artists in the world. We show our vast collection and promote Warhol's legacy not only here in Pittsburgh but also around the world. We send major exhibitions to Europe and Asia and we are working on a show in Africa right now and shows in both Mexico and South America next year. We have a very broad global reach and thus are able to expand his legacy around the world. We are constantly thinking about how to keep Andy Warhol interesting for future generations. We do a great deal of educational programs and outreach here in Pittsburgh and around the world. A major component of our exhibition program is educational programming with everyone, from elementary to high school students in the countries where we do exhibitions. The response is always fantastic, kids around the world instantly identify with Warhol. They love him because of his playful nature. Teenagers around the world love him because of his rebel nature. Lilia Ziamou: What is the museum's exhibition strategy? How do you approach traveling exhibitions? Eric Shiner: The building is seven stories tall and two years ago we put the collection into a chronological order. The visitor starts at the top and learns about Warhol as a child, then the story unfolds as he is in college, through his commercial work in the 1950s, and then on to the pop art and everything that comes after it. Our second floor is reserved for our special exhibition program, which is either a deep dive into Warhol - we just did a show called Warhol By the Book that looked at all of Warhol's book illustrations and work in the publishing industry - or shows of other artists. That's where we bring in contemporary art to keep it lively here in Pittsburgh, because, of course, we never want to be seen as a mausoleum to Andy Warhol. We want to be a living, breathing, organic museum that is looking at contemporary culture. In terms of traveling exhibitions, we do have our own package of exhibitions. Our curators in our education department put together engaging educational programming and we deliver that to a host institution. Or sometimes a curator of another institution works with our curators to put a show together. Or a museum will approach us and say, "We have this idea. We want to organize it ourselves, but we want to use your collection," and we are perfectly happy to do that. I believe that other curators and other institutions have just as much ability to define or discuss Warhol from their own perspective. This keeps the conversation alive. Lilia Ziamou: Tell us about contemporary art at The Andy Warhol Museum and the upcoming exhibition Andy Warhol | Ai Weiwei. Eric Shiner: I believe it is very important to keep Warhol alive through contemporary artists responding to him. Not only in a celebratory way, but also with a critical read. I think as an institution we like to remain a little bit critically distant, to make sure that we are never running the Andy Warhol fan club. Of course we want people to learn from him, but we never want to become a cult. We have done all sorts of great shows, from very direct relationships that an artist might have had with Warhol, such as the Michael Chow show, to a retrospective of Deborah Kass, who for ten years dedicated her practice to re-reading and re-making Warhol, through the insertion of herself into Warhol's aesthetic lexicon. With Ai Weiwei, we realized that a conceptual conversation could emerge between a living artist and an artist who is no longer with us but still haunting contemporary art in so many ways. Ai, like Warhol, looks to Marcel Duchamp as a point of inspiration in almost everything. Duchamp is the academic and aesthetic connector between the two of them. The message that I wanted to put forward with this show was to look at how Warhol radically changed the understanding of our world, aesthetically and socially. Many theoreticians, philosophers, and art historians have directly linked Warhol to where we are today. He was an influencer and I was thinking what other artist, today, is making us rethink the world around us. That boiled down to Ai Weiwei, through his social activism, through his political messaging, through his sense as a dissident artist, but now working within the machine itself. He is forcing mass culture to not forget about political atrocities. That's the story we are hoping to tell in this show and I'll be very interested to see what the reaction is. Lilia Ziamou: Tell us how Andy Warhol's life inspired the museum's decision to encourage differing political viewpoints. Eric Shiner: Since opening in 1994, we made a very conscious decision not to be a typical museum. We want to be as open, free and political as we can be, and not very many museums take a political stance. We are here to promote Warhol and his legacy, and one of the major components in his life was the story of a young boy who was poor, gay, sickly, who wasn't like the other kids, but even in his difference he was able to create his own universe and his own aesthetic. Ultimately he overcame all of these challenges and became one of the most famous people the world has ever known. We start around the very basic concept of how you give voice to someone that might not otherwise have it. I think it is critically important that a museum has a stance and that it has something to say to make the world a better place. If museums can't be that forum, I don't know where else these conversations can happen in society as it's structured today. To that end, we have started a project called Activist Print that features murals on a building we have across the street from the museum. The first project is about the Black Lives Matter movement and police violence. We are working with an African-American artist and with the Mayor of Pittsburgh and the Chief of Police. We also had a community forum where the project leader artist D.S. Kinsell was in dialogue with the Chief of Police to talk about how artists and their activism can help change thinking. We want to create a safe place where everyone can come with their own thinking, their own positions, and be given a platform to say what they want to say. Creating a safe and open environment is critical to create positive change. I think that it is something that we as an institution have to do, and I wish more museums did it as well.